Here’s a couple that puts a high priority on romance. Sun in Leo will take center stage, while Moon in Libra will be his adoring companion. She’ll love his grand, romantic gestures, but will become jealous if he focuses too much attention on the rest of his audience. Sun in Leo lives for the spotlight. Even if he’s not a performer or artist, he requires affirmations to feed his self-worth. His biggest supporter should be his partner, and it would be helpful if she wasn’t jealous. 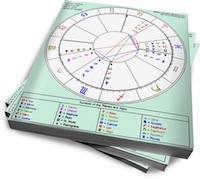 Sun in Leo is romantic and faithful, but flirting with others is his way of confirming that he’s still got it. As long as his lover is his main source of appreciation and support, he won’t stray. Moon in Libra needs everything to be pretty. This Venus-ruled Moon needs it on a literal level (with a stylish home and nice things) and on an emotional level (with a balanced partnership). Her partner should understand that although Moon in Libra will bend over backwards to make him happy, she can easily become jealous and resentful (although she’ll never admit to this). Passive aggressive jabs and frosty withdrawal are sure signs that she’s feeling unappreciated. Sun in Leo will shine brilliantly with the love and support he receives from Libra. She’ll instinctively know the exact words that will make him feel like a king. Moon in Libra will bask in the glow of Leo’s taste for high romance (and expensive gifts). But she’ll grow bitter if Leo forgets to show how much he appreciates her. And she really won’t like the attention he solicits from other women. All Leo needs to do is notice when Libra starts to act distant. Then, some tangible proof that she is still the center of his universe is all it will take to restore the balance between them. Moon in Libra may act like it’s not about her, but sometimes she needs just as much adoration as Sun in Leo.